Directions to our full water access marina with floating docks, outboard engine sales and service. Click map to get driving directions from Google Maps. - Take the Garden State Parkway South to Exit 30. - Proceed on Laurel Dr (Rt 52) through the toll booths and travel about 1.3 miles through the Route 9 intersection to the next light. - At the light, turn left onto Shore Road. - Make a quick right onto Goll Avenue. - Turn left onto Bay Avenue. - We are located on the right side of the street about two blocks down. - Take the Garden State Parkway North to Exit 29. - Follow Route 9 to the first traffic light. - Turn right onto Route 559 and travel about 1/2 mile to the light at Rt. 52. - Go through the intersection and make a quick right onto Goll Avenue. Our on the water location makes it easy to reach us by boat. - Proceed south under the tall Ocean City/Longport Bridge. 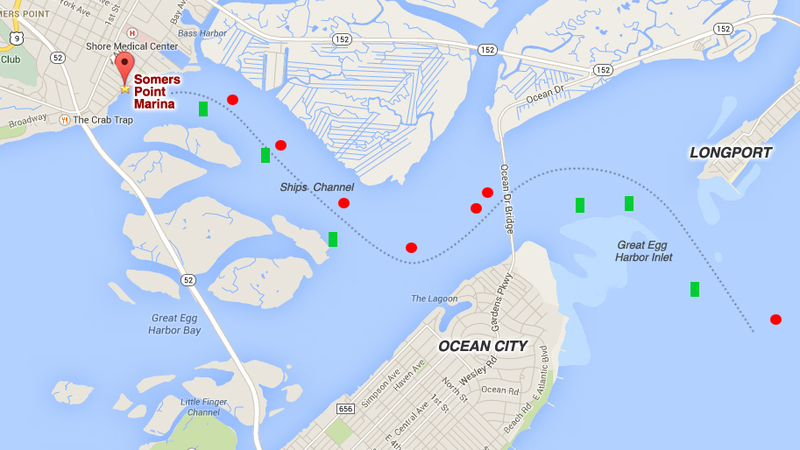 - After about 500 yards, follow Ships Channel which bears off to starboard and head straight for Somers Point. You'll see Shore Memorial Hospital (a large orange brick facility) straight ahead. - As you get closer, the channel bends to port and you'll see our large blue building on the right. - Secure your boat at the end of our T-dock and come on in. - We monitor VHF channels 16/68 if you need docking assistance.